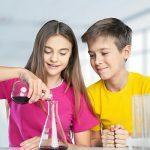 This Pre-Chemistry homeschool course for middle school and and high school students will focus on introducing students to the basic structure of elements and how elements combine to form compounds. Upon completion of this middle school course, students will be familiar with the Period Table, the structure of an atom and the mechanism involved in ionization and compound formulation. Everything you hear, see, smell, taste, and touch involves chemistry and chemicals. And hearing, seeing, tasting, and touching all involve intricate series of chemical reactions and interactions in your body. With such an enormous range of topics, it is essential to know about chemistry at some level to understand the world around us. Minimal lab supplies are required.